Lilies are an elegant flower which many people associate with Christmas. Wendy and David Millichamp offer some advice on how to help your lilies flourish this spring and summer. As well, they introduce two new lily varieties. 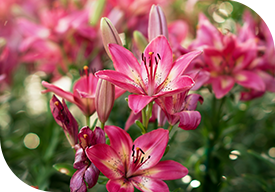 In your garden, choose an area for your lilies that has good drainage. Plant bulbs immediately after purchasing. Bulbs are gross feeders and root deeply. After planting, a good mulch of leaf mould or well rotted compost is beneficial. This will keep the soil cool and discourage weed growth as well as eliminating the need for soil cultivation which may hurt stem roots. Scatter balanced fertiliser over the ground every few centimetres as this helps keep bulbs healthy. Also use liquid fertiliser - Nitrophoska is great in early spring. Osmocote is excellent in pots and soil when planting bulbs. • Lilies need sunlight, but some varieties keep their colours better in a position where they are in filtered sunlight or semi-shade. Never plant where other lilies have failed to grow. Lilies have valuable stem roots and require sufficient depth to get the benefit of these stem roots. Bulbs should be planted with 10cm of soil on top, slightly less for smaller bulbs. The depth of soil is measured from soil level to the top of the bulb. Do not cut foliage on spring bulbs after flowering, let them die down as this plumps up the bulb for the following year. If lilies have black spots or browning on the leaves it is botrytis. To avoid this spray early spring with Bravo or Thiram. Lilies can be planted in pots filled with a good potting mix and Osmocote. Repot every three years, depending on how big the pot is. Add Osmocote every year. Here’s a good good fertiliser recipe for bulbs: 200grams of blood and bone, 250grams Osmocote (or any other nitrogen fertiliser), 250grams of Potash. Mix together and work into soil. This mixture will do approximately 10 bulbs. Give side dressing after emergence. Wendy & David have been lily farmers for 23 years. David, a delightful, fourth generation nurseryman focuses on production and despatch while Wendy, a floral designer, is responsible for marketing and sales. Their yearly mail order catalogue and wholesale business ensures gardeners across NZ can enjoy their fabulous lilybulbs. Visit their website at www.lilyfields.co.nz.